Morphe X Jaclyn Hill Eyeshadow Palette! Review and Swatches! I have been a subscriber of Jaclyn Hill&apos;s YouTube channel since I was in college! Although she faces a lot of criticism and is subject to various negative judgements, I still believe she is one of the best beauty influencers out there! I&apos;ve supported her through her collabs with Becca, purchasing Champagne Pop and then her limited edition Champagne Pop palette and eyeshadow last year. I watch her every day on Snapchat and knew how much work she was putting into this project with Morphe Cosmetics over the last two years, but I didn&apos;t want to buy the palette on the release date. I don&apos;t know if I was just hesitant, or uncertain of the true quality behind the product, but I wanted to wait to watch and read more reviews before buying it. I also have a lot of eyeshadow palettes in my collection that I&apos;m desperately trying to get rid of, so I knew this wasn&apos;t something I "needed" or couldn&apos;t live without. After watching a lot of positive reviews and seeing some beautiful live swatches, I did decide to buy it whenever I saw it was going to be restocked! I luckily got ahold of it before it sold out, again! Jaclyn did update her subscribers and let everyone know that Morphe will continue restocking this palette until everyone who wants one, has one. I&apos;m kind of over the whole "limited edition" craze with makeup brands these days, but I do like that they&apos;re at least willing to restock until everyone can own one! To begin this review, I wanted to let everyone know how to purchase this palette. Morphe Cosmetics is only available online at morphebrushes or at their only retail store location in Burbank, CA! The palette retails for $38.00 and comes with 35 eyeshadows (such a steal!) They are pressed shadows that come in matte, shimmer, satin, foil, and glitter formulas! It has been said that the Jaclyn Hill palette shadows are higher quality than those found in regular Morphe palettes and I can definitely agree with that. 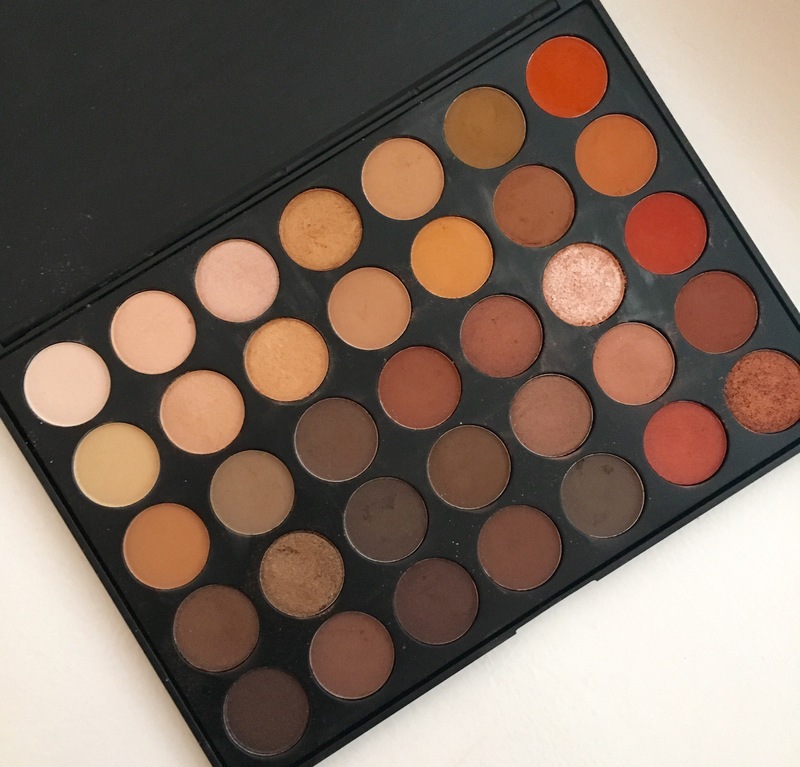 I do own a couple of the regular, permanent Morphe palettes and they are awesome for the price and I do use them a lot, but some of the shadows can be hit or miss. Right off the bat, just from touching these shadows, I can instantly tell a difference in how much more smooth and buttery their texture is. I love the variety in colors as well. I know people are so over warm toned eyeshadow palettes, but Jaclyn did a really great job incorporating some neutral, cool-toned and bright shades. I also think that you can easily create a super natural, every day look, but also have the versatility to do something more bold and fun for special occasions! I love that when I look at this palette, I immediately feel inspired to create. I think that too often I get into a rut with my makeup and just buy the same products over and over because they work for me and apply them in the same ways, not incorporating any new techniques. I really think this palette is going to help me get out of my makeup comfort zone and enjoy the process while doing so! I want to do a day-to-night makeup look using this palette, so please leave me a comment below if you would like to see something like that! Now it is time for the fun part, SWATCHES! 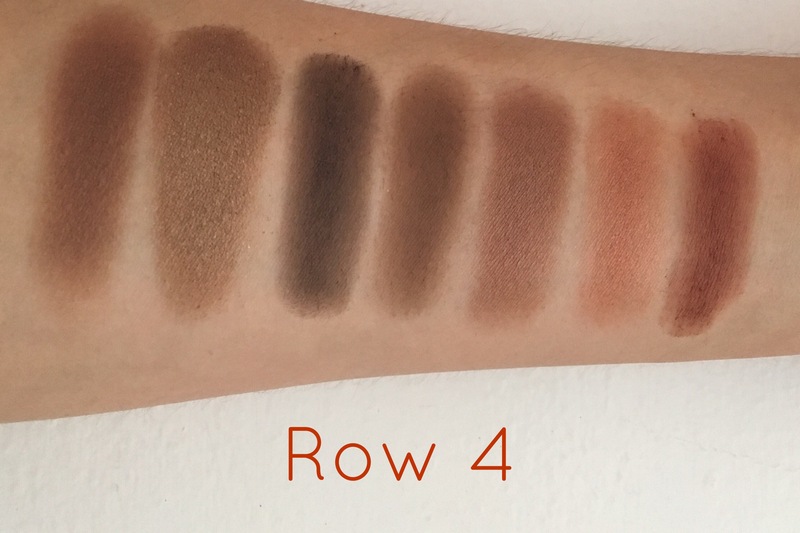 Does anyone else get super excited to see real, unedited swatches on just normal girl arms  Like I&apos;m not that good at making the shadows look symmetrical and even, so I feel like my swatches are raw and real haha they show the true quality of the shades and give a realistic expectation of the formula, which I think is more helpful and impressive in the end! Let&apos;s just go row-by-row starting from the top! Then I will tell you my absolute favorite shades from the palette and which ones I find a tad bit lackluster. 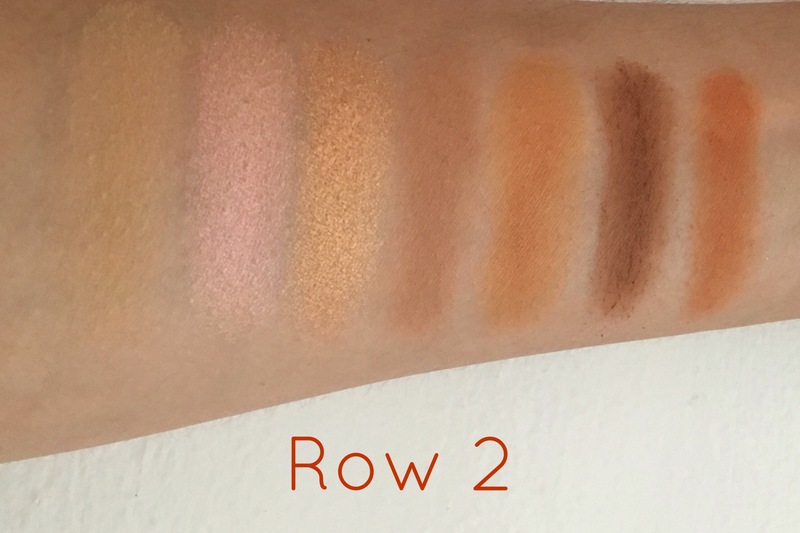 Row One is such a beautiful, natural array of colors that I imagine would work as perfect "every-day" shades. I am IN LOVE with the colors, "Faint" and "Sissy" and I was super impressed with the matte shades as well. I know I&apos;ll be using "Silk Creme" as a transition shade for many of my makeup looks! 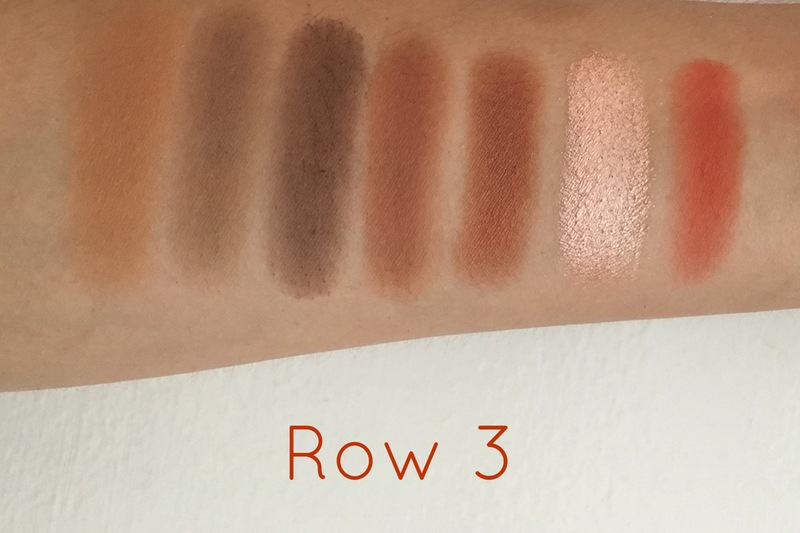 Row Two is my absolute favorite because it looks like a warm sunset and I love those orange-bronze tones on my eyes! "Queen" is such an attention-grabbing, metallic gold and I can see myself using this every day all over the lid. I also love the mattes in this row as well, they all swatched so smooth and were very evenly pigmented. Row Three is comprised of warm, cranberry-red colors. I can see myself hitting pan on each one of these shadows in the Fall, whenever I want those sultry, burgundy toned eye looks. Row Four starts to incorporate color with "Royalty" and "Twerk." Although I&apos;m not obsessed with wearing bright colors on a daily basis, I do love adding pops of color on my lower lash line and these rich jewel tones will be perfect for that! Unfortunately, I did find that the shade "Mocha" was a bit chalky and I had a hard time building up the swatch to appear more smooth. Row Five is probably my least favorite, not because the shadows are bad, but because I don&apos;t think I&apos;ll personally get a lot of use out of the more green shades. I can see myself playing around with "Diva" and "Enchanted," but I don&apos;t think the bright turquoise colors are something that would flatter my eye color or match my personal style. Who knows though, I may end up absolutely loving them once I play around more with the palette! My final thoughts are that this is actually a really good eyeshadow palette and I&apos;m pretty shocked at how affordable it is for how many shadows are in it. You&apos;re getting 35 high quality shadows for $38…that&apos;s a steal! You can also use the coupon code "JACATTACK" for an extra 10% off! It actually makes me a bit frustrated with more expensive brands like Marc Jacobs and Tom Ford, because their eyeshadows are not as good and cost three times more for less product! The actual packaging of this product is pretty cheap, I&apos;m not going to sugar coat it. It&apos;s cardboard and I can already tell that it&apos;s going to get makeup smudges all over it because it&apos;s white, but I care more about what&apos;s in it! If it&apos;s a high quality product in low quality packaging, that was super affordable…I can easily overlook that. It&apos;s more angering when it&apos;s the other way around! If you love Jaclyn Hill and you weren&apos;t sure if this was actually worth the hype, I can honestly tell you that it is. If you don&apos;t know who the heck Jaclyn Hill is, but you are interested in the palette, then I would still say you should buy it! There are a ton of YouTube tutorials and blog posts out there on the various ways you can create natural and glamorous eyeshadow looks using this one product! I&apos;m super happy that I was able to get my hands on this palette and I really would like to do an "Everyday Makeup Look" or "Day-To-Night Eyeshadow Tutorial" using this, so let me know if you would be interested in seeing those! Have you tried out this palette yet? What are your thoughts? Leave me a comment below, I love talking with you guys about makeup! Thank you so much for reading and I hope you all have a great week! P.S. I have been posting a lot over on my Instagram! I&apos;ve been doing a lot of fun Insta stories too! Follow me on there for more reviews and fun girly things! The Best Affordable Fall Eyeshadow Palette! If you have been searching high and low for the perfect Fall eyeshadow palette, well look no further! The Morphe 35O – 35 Color Nature Glow eyeshadow palette is only $22.99! So you are getting 35 richly pigmented, shimmery and matte eye shadows that are all warm-toned, Fall shades. I find this palette is amazing for both daytime and dramatic looks since it has a variety of light and dark colors. Also there a couple of eyeshadows in this palette that give off an intense foiled effect that you can usually only find in high-end eyeshadow formulas. If you are just starting out with makeup and looking to build your collection, then you should definitely purchase this palette! Morphe also has a lot of other eyeshadow palettes on their website that are all matte or cool toned or neon if you aren’t into this particular one! 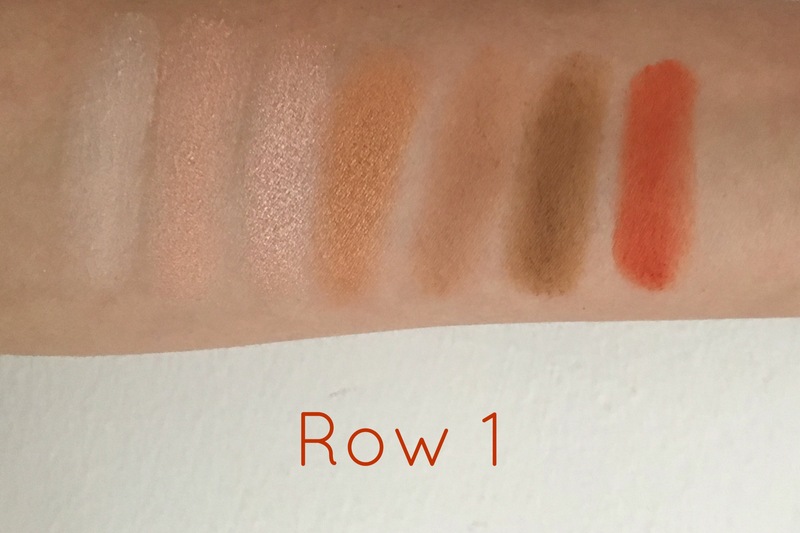 When I began swatching these shadows, I realized just how pigmented they are and buttery soft! I find that it is so hard to find affordable matte shadows that aren’t chalky. However, these are so soft and blend out like a dream so you can’t go wrong! The shimmery shades are just as beautiful and give your eyes just the perfect amount of definition. There are so many gorgeous all-over-the-lid shades to help you achieve an easy, quick eye look. As I mentioned before, you’ll see in the swatches that there are a few foiled shades that are so bright and glittery! I love these eyeshadows because they look like a loose glitter pigment, but they’re 10 x easier to apply since they’re in a pressed pan and don’t have any annoying fall out! 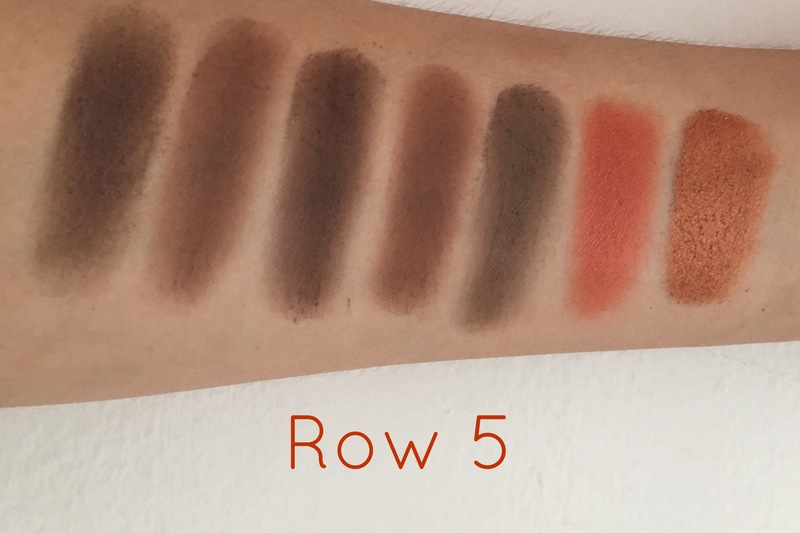 Here are some swatches row-by-row! I wanted to mention that there are always coupon codes floating around to save even more money on Morphe makeup! I always use the code “JACLYN” for an extra 10% off! Also since these are only available online (since I live in MD and not California) you do have to purchase online at MorpheBrushes.com or click the link here to shop the 35O palette directly! I want to do another blog post on my favorite Morphe brushes because they are really high quality and very affordable! I know the 35O palette is so popular and loved by many, but I want to try out another palette and see if it’s just as good! 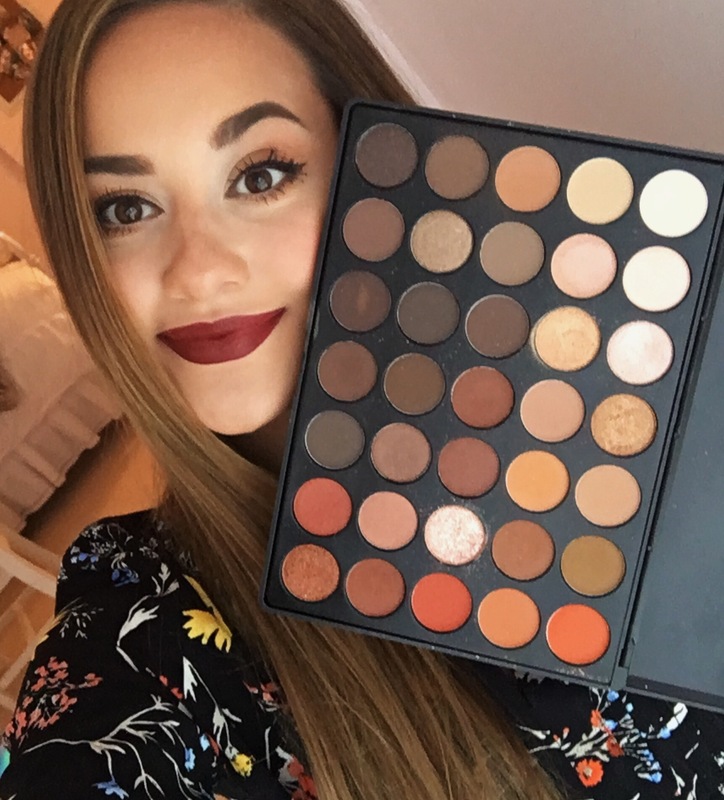 What is your favorite eyeshadow palette by Morphe? What brushes do you love using? Let me know because I would love to try those out!